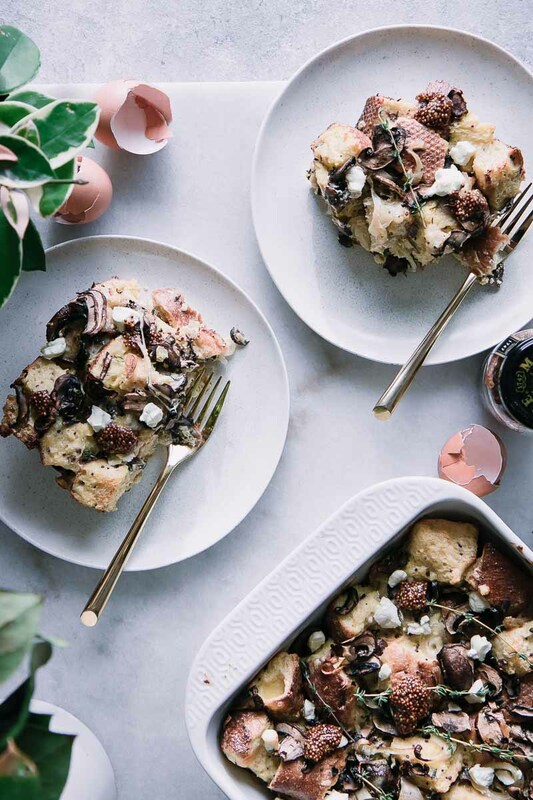 Mushroom Dijon Sourdough Breakfast Strata, a simple one-pan spring brunch casserole made with mushrooms, shallots, Maille Old Style Mustard, goat cheese, mozzarella, and fresh thyme that’s the perfect make-ahead breakfast recipe. Simple, savory, delicious! Strata is a simple one-pan spring bunch classic! This post is sponsored by Maille, please see our Disclosure for more information on sponsored content. 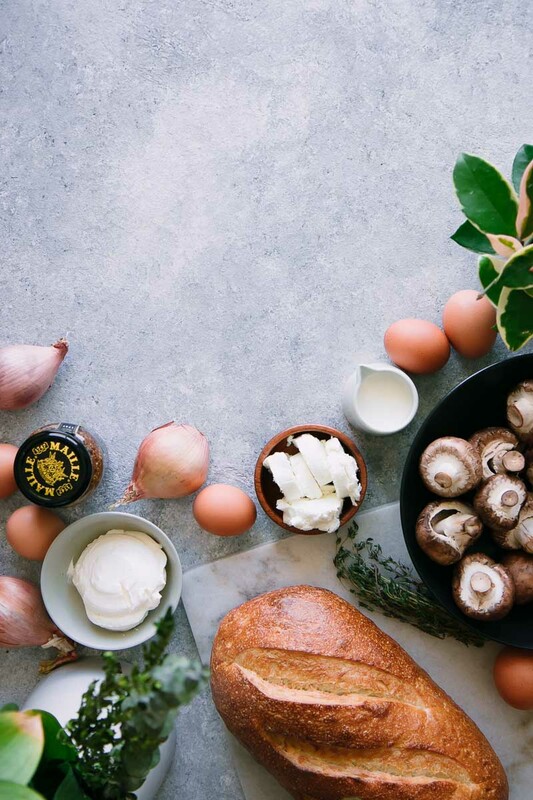 All the ingredients you’ll need for a Mushroom Dijon Sourdough Breakfast Strata: sourdough bread, eggs, mushrooms, shallots, mustard, herbs, milk, and goat cheese. Cut a full loaf of bread and either dry out or toast in the oven. I used sourdough bread for a tangy flavor, but french bread or whole grain bread would be delicious as well. Experiment! Cook vegetables that will mix with the bread. 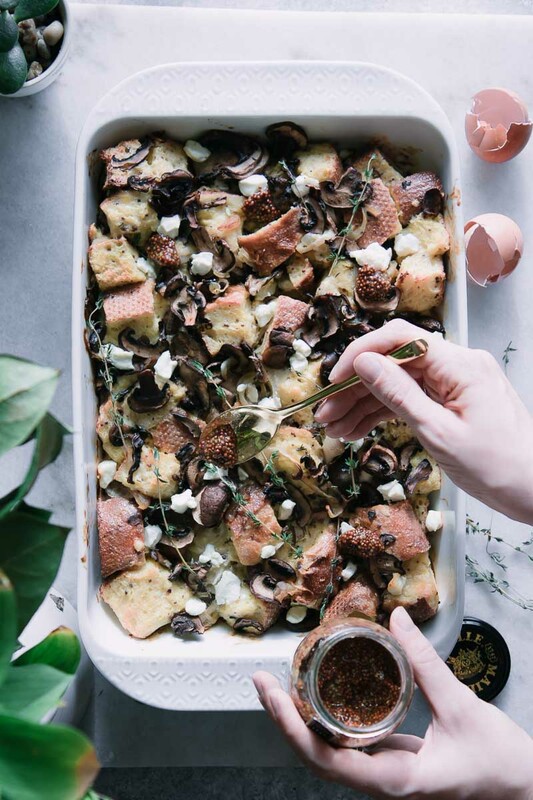 For this Mushroom Dijon Sourdough Breakfast Strata we’re using mushrooms and shallots and seasoning with a bit of fresh thyme. Make an egg custard sauce from eggs, milk, cream or yogurt, and seasonings and spices. Mix together about 10 eggs with creamy milk (we used whole milk) and either yogurt or sour cream. Season with fresh herbs, salt and pepper, and a few spoonfuls of Maille Old Style Mustard. Mix the bread and vegetables, then soak in the creamy egg sauce. Next it’s time to mix it all together in a large bowl and let the liquid soak into the bread. Pour into a baking dish and bake until soft with a golden brown crust. Finally it’s time to pour the soaked bread and vegetables into a baking dish and bake in the oven until the egg-y liquid has cooked throughout, leaving the bread soft and flavorful, but the top of the strata golden brown with a light crunch. 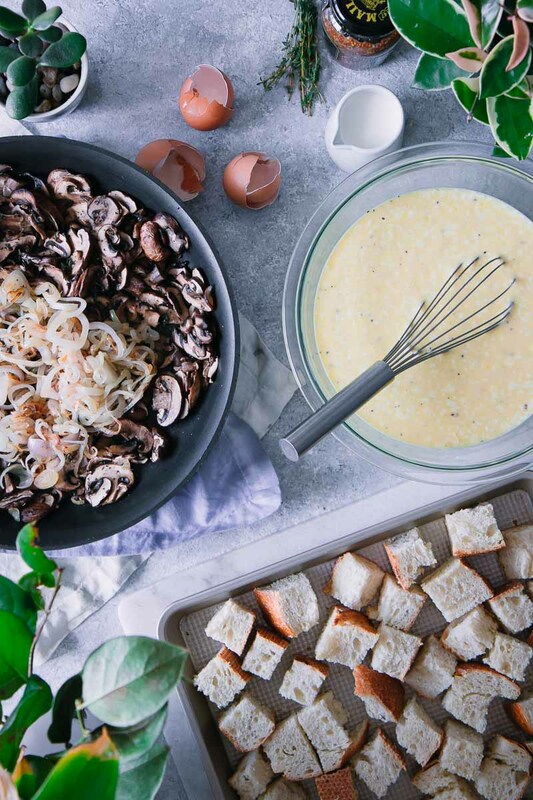 Making a Mushroom Dijon Sourdough Breakfast Strata is simple: toast sourdough bread, mix with egg and cream custard, cheese, and cooked mushrooms and shallots. Season with spices, bake, and enjoy! Get creative with flavors! Once you get the base recipe down, experiment with your favorite vegetables, cheeses, and herbs. Try different seasonal vegetables like asparagus in the spring, spinach in the summer, and even squash in fall and winter. Use different cheese combinations like cheddar, gruyere, or pepper jack, and fresh herbs like basil, oregano, and sage. I always include a spoonful of dijon mustard, like Maille (see all of Maille’s flavors here). The possibilities are endless! 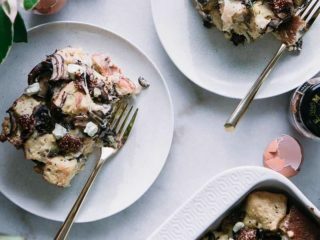 After baking your sourdough breakfast strata, top with goat cheese, fresh thyme, and a few dollops of Maille mustard for extra flavor. a simple meal prep recipe that can be made once and eaten all week! Love this simple strata recipe? Check out our other savory brunch recipes, like this Mediterranean Chickpea Harissa Frittata or Smoked Salmon Breakfast Bowl. 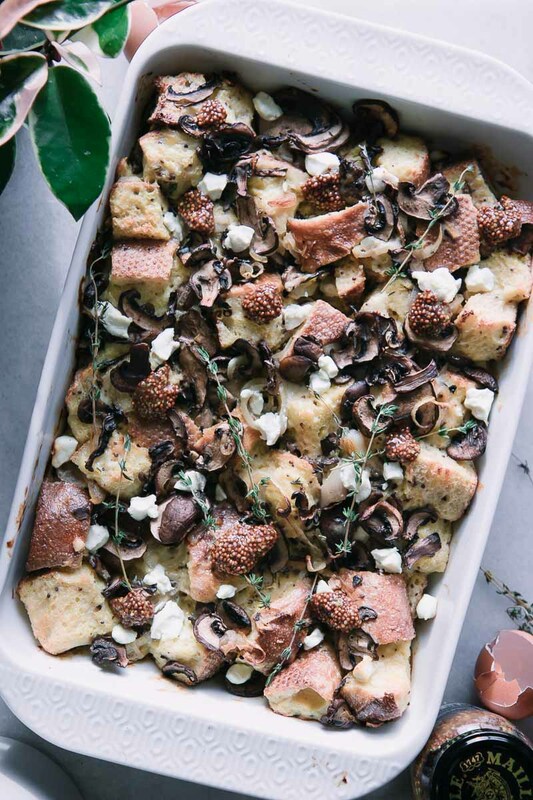 Mushroom Dijon Sourdough Breakfast Strata, a simple one-pan spring brunch casserole made with mushrooms, shallots, mustard, goat cheese, mozzarella, and fresh thyme that’s the perfect make-ahead breakfast recipe. Simple, savory, delicious!